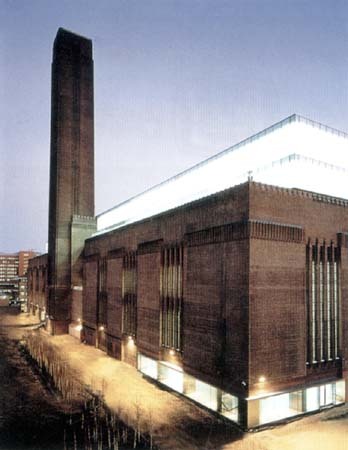 my all-time favourite would definately be Tate Modern Gallery in London. I don't know what it is about it but it has a really calming effect on me, especially the Turbine Hall, I love it, love the space around it, love the symmetry. the barnes and noble in metairie...i could stay in their with somebody for hours. so much stuff to look at and i'm excited by all of it . i'm that person who you find in the corner reading odd books and strange books(at least for my age). the way that it's designed is great for reading. c) it's full of BOOKS. What more could you ask? ...Oh yeah, it also has a coffee bar. Sorted! Oh my god that place is so awesome. The Battersea Power Station at Battersea, London. It's the building on the cover of Pink Floyd's 'Animals' release, and also stood in for the Ministry Of Love in the 1984 remake of the movie adaptation of George Orwell's '1984'. Hawkwind's 'Quark Strangeness And Charm' release features photo's of Battersea's Control Room B.
oh yeah Fogman, that's one of my favourites too. amazing pics, I never managed to catch it that well. i spent an afternoon wandering around it about 2 years ago - it was great. this is a really good idea for a thread by the way. I don't know why I thought at first that this palace must be somewhere in Thailand... it looks a little bit like a mixture of a thai temple with a Gaudi building. yes it does a bit. the guy who built it (on his own) was an uneducated postman, but after he'd been working on it for a few years people started telling hims things like 'hey, it looks like a south east asian palace' & so on, & i think at that point he started looking up art books. Who is your favourite member of your favourite rock band? What do you think of this building project?